Un edificio espacioso con vigas de roble originales y horno de pan. En la planta baja hay un salón / comedor y cocina. El salón / comedor tiene TV / DVD / HiFi y una estufa de leña. La cocina está bien equipada con vajilla / cubiertos / utensilios y tiene una tostadora, cafetera, tetera, cocina de gas / horno eléctrico, microondas, nevera / congelador y lavadora. Arriba hay un amplio dormitorio con cama doble y baño con ducha. Un secador de pelo, plancha / tabla de planchar también se suministran. Situado en el departamento rural de Correze, Villas de Leypinas ofrece un retiro tranquilo con atracciones históricas y actividades para los aventureros que se encuentran cerca. Las 3 villas han sido creadas en edificios agrícolas restaurados, cada uno con su propio carácter. El acceso es a través de un camino privado. Cada villa tiene una terraza privada y sombreada con mesa, sillas y una barbacoa con vistas a los grandes jardines y al campo de Correzien. Hay una piscina de agua salada de 12m x 5m. Prachtige rustige ligging. Alles heel goed onderhouden en verzorgd. Aardige eigenaren die de hele dag met raad en daad klaarstaan. Een fantastisch uitzicht vanaf het terras. Je moet van rust houden maar dan zit je echt perfect. Superb gite in fantastic location. On arrival at Villas de Leypinas, we were welcomed by the owners, Jacqui and Dave, who provided a guide tour of our gite and the facilities available within the complex. The accommodation was exactly what we had hoped for when we booked, in that it was spacious, clean and well decorated throughout, the kitchen was well equipped and the bed comfortable. Throughout our two week stay, we ate all our meals on the patio and enjoyed barbeques most evenings. 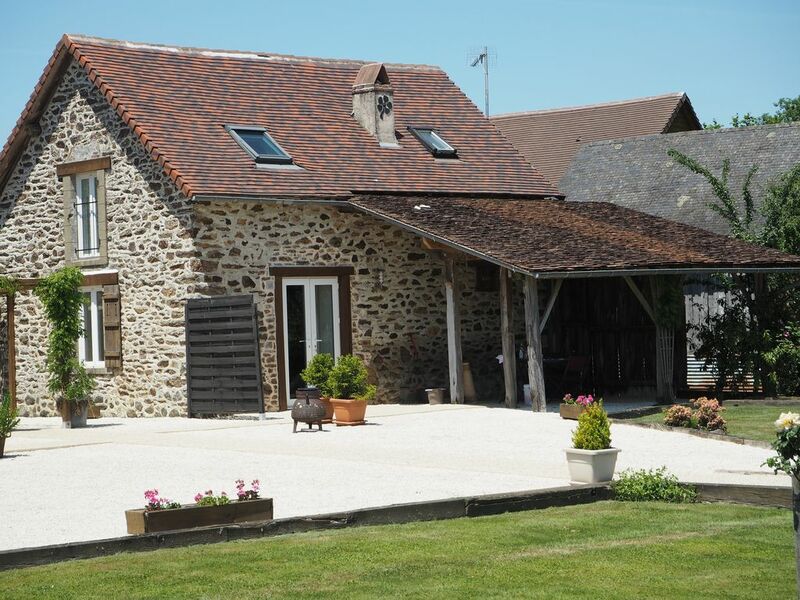 When booking, we new the location was rural and traditional France and we weren't disappointed. The surrounding countryside was stunning and we took long walks, taking in local villages along quiet lanes and around lakes. We also took time to visit places of interest within easy reach, such as Collonges la Rouge, Curemonte and Turenne, reputedly three of the prettiest villages in France, Oradour- sur-Glane, the martyred village, Pompadour, the equestrian centre and National Stud, the Sunday market at Objat and the nearest cities of Limoges and Brive la Gaillard. On days when we were just looking to relax, we just lazed around the pool. Any concerns we had about proximity to supermarkets were dispelled, when we found the local Super U and Lidl's stores were only a 10 minute drive and the Carrefour Hypermarket near Limoges about 25 minute. Jacqui and Dave living on the complex was a major plus, in that their helpfulness and advice, friendliness, flexibility and enthusiasm for their guests to enjoy their holiday was amazing. Their philosophy of continual improvement and upgrading the facilities was impressive. During our holiday, they replaced the pool umbrellas, upgraded the television in our gite so we could watch Euro 2016 and had furniture delivered for the newly built sundeck, so that guests could sit comfortably while enjoying each others company and a drink, whilst watching the sun go down, as did we on our last two evenings. It's little wonder, that during our stay Villas de Leypinas was awarded a 4* rating, the first in the area. The whole package is first class and we would have no hesitation in recommending this property to our friends and relatives. Very easy to find and a warm welcome awaits. The gites and grounds are immaculate everything you need for a relaxing break. Peace and tranquillity in a beautiful setting very rural location but supermarkets within a 10min drive. The gites are fantastically equipped with all the gadgets needed in the kitchen with a basic store cupboard provided and a lovely welcome basket of goodies. Location is ideal to visit some lovely places Pompador is a must Collange du Rouge and Gimel de Cascades fabulous. Lovely to get back to have a chat with Jacky and Dave then chill out by the pool with a cheeky glass of wine. There are books and a great selection of dvds to borrow. When we left we felt like we were saying farewell to good friends a lovely stay.